The fabled Rutland Railroad was never widely regarded for its passenger services, predominantly running local and secondary trains across its system in Vermont and northern New York. However, it did field two notable names, the Mount Royal and Green Mountain Flyer. Both provided long-distance travel from New York City (as well as Boston) and Montreal, Quebec in conjunction with several partnering roads. Since this corridor was well-covered by surrounding railroads such as primary competitor Central Vermont (which operated its own north-south route across the state) the Rutland struggled to gain much traction in the market. However, its accommodations were quite respectable nevertheless considering the company's constant financial situation. Unfortunately, monetary troubles and labor relations hampered it in the postwar years and all passenger service ceased in the early 1950s. The classic Rutland was tucked away in the northern New England where it served its home state of Vermont as well as parts of New York. The road passed through some of the most spectacular countryside the region had to offer as it wound its way through the Green Mountains and along the shores of Lake Champlain while passing amongst such communities as Bellows Falls, Rutland, Bennington, and Burlington. The Rutland also looked the part of a New England railroad in other ways; lucrative milk shipments were a longtime mainstay of its freight business while beautiful covered bridges graced the right-of-way, notably along the Chatham Branch (otherwise referred to as the "Corkscrew Division" for its numerous sharp curves and steep grades). 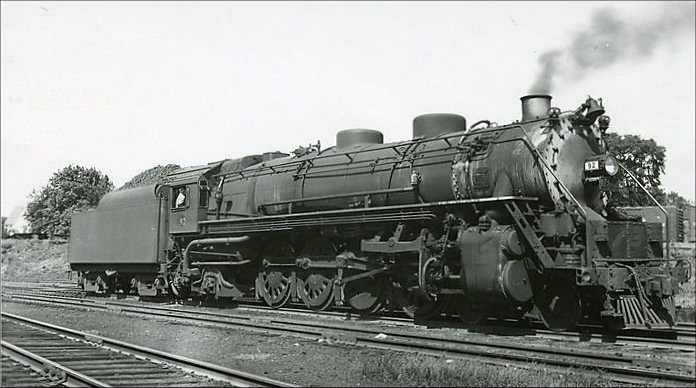 According to Kevin Holland's book, "Passenger Trains Of Northern New England: In The Streamline Era," Rutland's passenger timetable predominantly featured local runs. For instance, one of its schedules from the 1930s notes the following such services: the "Ogdensburg Local" (#57-87) running in each direction providing coach accommodations between Ogdensburg, New York and Albany via Rutland while a through sleeper was offered to New York City (until World War II this train also provided a through sleeper to Boston); the "Alburgh Express" (#51-43) between New York and Ogdensburg via Alburgh (a sleeper was offered between New York and Burlington); the "Troy Local" (#56) between Rutland and Albany via Troy (a sleeper also ran between Albany and New York); and finally the "Rutland Local" (#46) between Ogdensburg and Rutland (a sleeper running via the Mount Royal ran between Burlington and New York). The railroad also provided service over its Chatham Branch until the World War II era with a local running daily-except-Sunday between Bennington, Vermont and Chatham, New York. The trains even offered through connections to New York via the NYC as well as Albany and Pittsfield (Massachusetts) over the Boston & Albany. The "Corkscrew Division," however, was abandoned and taken up in the summer of 1953 citing lack of business. While the Green Mountain Flyer has long been regarded as Rutland's top service the Mount Royal actually provided a few more services, at least from the 1930s forward. The train, listed as #51, northbound, and #52, southbound, also offered a Boston connection like its counterpart. It would leave Grand Central Terminal after dark around 9:30 PM and arrive in Montreal the next morning for breakfast just before 8:00 AM. Its southbound counterpart left Bonaventure Station just after 9:00 PM and arrived back in New York the next morning before 7:00 AM. During the era of business travel by train such clientele could be found on the Mount Royal although perhaps not to the degree as some others offering more luxurious accommodations. A typical consist for the Royal included a lounge-buffet, diner (Burlington-Montreal), reclining-seat coaches, and three sleepers (New York-Montreal, New York-Burlington, and New York-Rutland) while the Boston section provided essentially the same amenities with one through sleeper of its own. Since the Rutland was habitually financially strapped it never had money for lightweight equipment during the streamlined era although B&M "American Flyer" lightweight cars, built in the mid-1930s, occasionally ran through over its rails. Interestingly, perhaps the closest Rutland ever came to streamlining was a lightly shrouded 2-8-0 Consolidation, #28, that was named The Whippet to promote an expedited freight service the company launched on January 9, 1939 (the service didn't prove particularly successful). 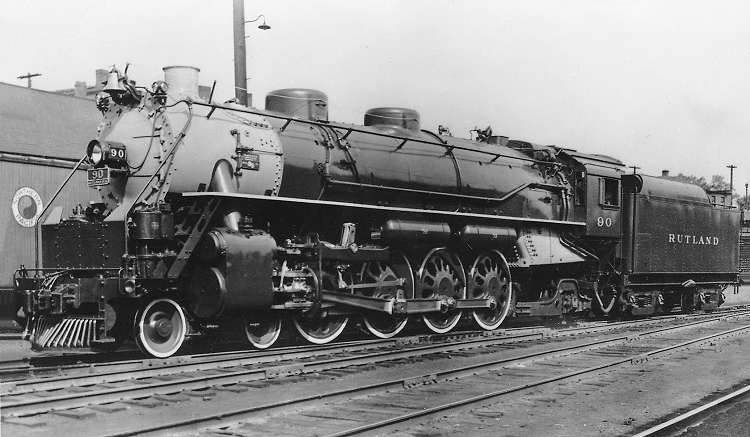 Power for its trains usually included a fleet of 4-6-0 Ten-wheelers and 4-6-2 Pacifics while newer 4-8-2 Mountains sometimes handled assignments once they arrived in 1946. As a means of cutting costs and boasting revenues the Rutland purchased new RS1 and RS3 diesel road-switchers from Alco beginning in 1951, which also pulled double-duty on passenger consists. By that time ridership was sinking and a strike severely crippled the railroad in the summer of 1953. On June 26th that year it was successful in discontinuing all remaining passenger services.